Retinal artery occlusions occur when a plaque or clot becomes lodged in a retinal artery and prevents blood from flowing past it. These blockages cause damage to the retina due to lack of blood flow. In the short term, this loss of blood flow can cause swelling of the retina. If the blood flow remains poor, it can lead to death of the retina cells and subsequent loss of vision. Central Retinal Artery Occlusion (CRAO) – A central retinal artery occlusion occurs from a blockage of the main retinal artery as it enters the eye at the optic nerve. Branch Retinal Artery Occlusion (BRAO) – A branch retinal artery occlusion involves blockage of one or more of the smaller retinal arteries. 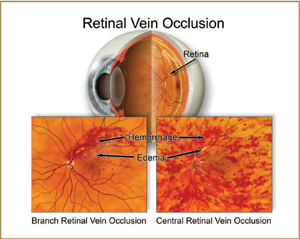 Symptoms of a retinal artery occlusion vary based on the degree of impairment of blood flow to the eye. Sudden, painless loss of vision, either partial or complete, is the most common symptom. Loss of visual field, or a blurry or gray spot in the vision can also occur. Your doctor can diagnose a retinal artery occlusion based on examination of your eyes. Often a clot or plaque can be seen inside the blocked artery. Other diagnostic tests such as a fluorescein angiogram can be helpful in determining the degree of loss of blood flow. Unfortunately, there are no good treatments for a retinal artery occlusion. In very early cases, attempts can be made to lower the eye pressure with eye drops or a procedure called anterior chamber paracentesis. However, even with eye pressure lowering treatments, there is often little change in the blood flow status of the eye. In severe cases, abnormal blood vessels can grow that cause eye pain and glaucoma to develop. In these cases, laser treatment can be used to try to help control the eye pressure and relieve pain.